May 10, 1970. Game 4 of the Stanley Cup Finals. Boston Bruins vs. St. Louis Blues. Forty seconds into sudden death overtime, Derek Sanderson dishes the puck to Bobby Orr, who one-times it past the Blues’ goaltender, getting tripped up in the process and sailing through the air. By the time he landed on the ice, the Bruins’ 29-year Stanley Cup drought was over and the capacity crowd of 14,835 was in a frenzy. May 26, 1987. Game 5 of the NBA Eastern Conference Finals. Boston Celtics vs. Detroit Pistons. Down 107-106 with five seconds remaining in the fourth quarter and Detroit in possession of the ball, Larry Bird steals an inbound pass from Isaiah Thomas and lobs it to Dennis Johnson, whose layup puts the game away in front of a hysterical crowd of 14,890. The Boston Celtics went on to beat the hated Pistons in seven games before falling to the even more hated Lakers. These are indisputably two of the greatest moments in Boston sports history. Some of you may have witnessed them as they happened. Most of you, myself included, either hadn’t been born yet or were too young to care. Yet they live in our collective consciousness, even if we weren’t around to enjoy them. You can watch them on YouTube any time you like. And in the days prior to such instant online accessibility, you may have seen them replayed countless times on television. Even before that, though, you might remember being a kid and hearing your dad, uncle, or older siblings or relatives recounting those moments with a feverish reverence. You didn’t need to understand the X’s and O’s of a sport to sense the passion that your family had for a team. The ecstasy of victory, the agony of defeat, the unbridled emotions elicited simply from watching a game on TV – they created a powerful aura, and whatever its source, you wanted to be part of it. That’s why, to this day, I get the chills whenever I walk into the TD Garden and catch my first glimpse of the spoked B on the ice or the leprechaun on the parquet. I forget about the overpriced tickets, the overpaid players, the lockouts, and all the other nonsense that emanates from modern-day pro sports. I feel like a kid again, awestruck, as if attending my first-ever game, while at the same time appreciating the significance of taking part in a time-honored tradition that started before my grandparents had even met. This feeling, I suspect, is not unique to me. And I think the joy that comes from immersing ourselves in such a rich tradition might explain why, despite a plethora of bars around Causeway Street where you can grab a pre- or post-game beer, the windowless, no-frills dive with the green, dimly lit, 70s-era sign is always jam-packed on game day. Because while you can’t watch the Bruins or the Celtics in the same building your parents or grandparents did, you can have a drink where they did. Located right around the corner from the Boston GardenShawmut CenterFleet CenterTD Banknorth Garden TD Garden, Sullivan’s Tap opened in 1933, the year Prohibition was repealed. I doubt it’s gotten much in terms of upgrades or makeovers since then, but I’ve yet to hear anyone complain about that. Sully’s, as it’s affectionately known, is a Boston institution. Long before the area around Causeway Street became a hotbed of sports bars vying for the attention of Garden crowds, Sully’s was there. Plenty of bars and restaurants have opened and forever closed their doors in that time. Yet this unpretentious, blue-collar bar still stands. And having been anointed “Best Bruins Bar” by Boston Magazine and “Best Pre-Garden Bar” by the Improper Bostonian as recently as 2010, I’d wager a guess that Sully’s isn’t going anywhere anytime soon. Accolades aside, Sullivan’s Tap is pretty much your typical dive bar. There’s a drop ceiling and the rust-colored tile floor that seems to come standard in places like this. No tables, no food, and no credit cards accepted – cash only. Barely an inch of wall space is visible beneath the neon Bud signs and framed pictures that tell a century’s worth of Boston sports stories. Even the large beer mirrors have printed drink specials and price lists taped over them. And like any dive bar, Sully’s is not without its endearing quirks. 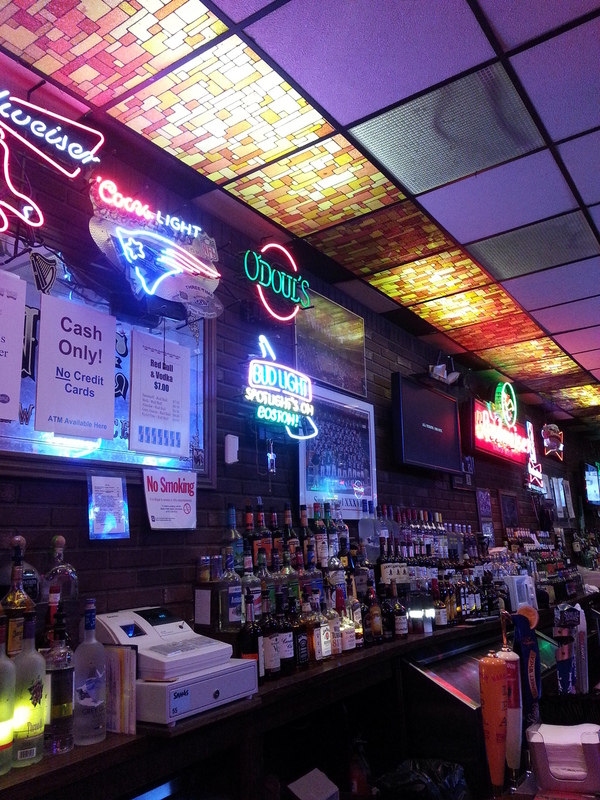 As soon as you walk in, you can’t help but notice how incredibly long Sully’s is. There’s even a sign proclaiming it to be the longest bar in Boston, in case you needed confirmation. Support posts make the narrow space even more challenging to navigate when the crowd swells. The men’s room is unforgivably anachronistic (if you’ve seen it, gentlemen, you know exactly what I’m talking about). Stretching almost the length of the main room is a bar with a whopping 30 stools (most places I’m in have about a dozen seats at the bar). The bar itself has a laminated top, and immortalized beneath the clear plastic surface are tickets from old Bruins and Celtics games. There’s also a decent-size game room of sorts, with all the dive bar staples: two coin-op pool tables, five arcade games, and a couple of basketball hoops games. The resulting vibe is that of a finished basement in a suburban veterans’ hall – exactly the kind of place where you could envision an older generation gathering to debate the current state of the B’s or C’s over a few brewskis. Of course, a dose of nostalgia and a close proximity to the Garden aren’t Sully’s’ only merits. For starters, it’s a pretty inexpensive place to drink. And that’s actually what prompted this post – as the country teetered on the fiscal cliff last month and my post-holiday credit card bill arrived, I figured it might be a nice time to hit some bars where I could find some cheap beer. Sullivan’s Tap didn’t disappoint. 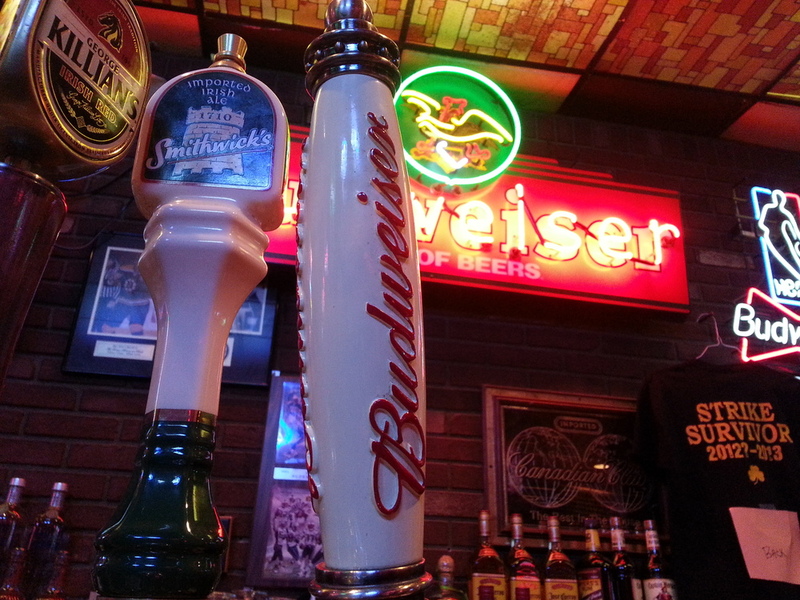 There’s 15 or so beers on draft, and they’re the usual suspects – Bud, Bud Light, Blue Moon, Stella, that sort of thing. The bottle selection is mostly more of the same. If you’re looking for Pretty Things, Slumbrew, and all the other popular microbrews, you won’t find them at Sully’s; but you also won’t pay more than $5.50 for a beer. As affordable brews go, a 16-ounce Bud Light “bottle” (assuming it still counts as a bottle when it’s made of metal) will run you $4.25. A 12-ounce PBR, served in an actual bottle (i.e., made of glass), will only cost you $3. If you insist on a higher class of beer, you’ve got Guinness, Bass, Harpoon, Long Trail, Smithwick’s, and a few others to choose from. I tried the Black and Red, made with Guinness and Killian’s. As I’d never had this particular pairing before, I take it as evidence that even at an old place like Sully’s, you can find something new. The Guinness/Killian’s combo was more interesting than I was expecting, with a surprisingly smoky essence; and at $5.50, not a bad deal. But if you want to adhere more closely to tradition and drink like your forebears, why not opt for a New England classic? At $3 for a 16-ounce can, the Narragansett tallboy is the best deal in the house. A $3 can of beer is what I instinctively order when I come here, but Sully’s’ liquor shelf is amply stocked if you need something stronger. On one of my recent trips, I opted for a rum and coke, which came in at a modest $5. I’m sure the bartenders here will make you whatever you want, but I can’t imagine ordering anything more complex at a place like this. At least not on a game night. But that brings me to one of the other charms of Sully’s – when there’s not an event at the Garden, the atmosphere can be quiet, almost private. Being so close to North Station, I would expect a place like this to draw a sizable crowd of people stopping in for a drink before their commute home. But around 5 p.m., I typically see fewer than 10 people here; and, much like at the Beacon Hill Pub or Whitney’s, it’s usually a few older guys who look like they’ve been there for most of the afternoon. That makes Sully’s a good place in which to collect your thoughts after a trying day, or when you’re looking for a quiet place to chat with a friend or shoot some pool. 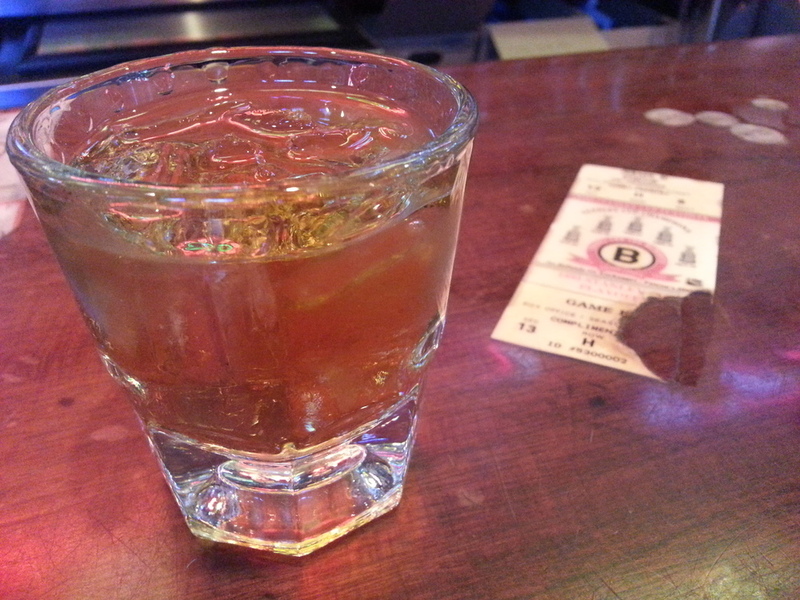 One night I enjoyed a Jameson on the rocks while waiting for my train. It made for a pleasant half-hour of hanging out, just watching ESPN and killing time. No crowds. While I was there, a guy came in and sat a few seats down from me. He ordered an Absolut and soda, drained it in two minutes, and left again. It can be that kind of place. But game night is a different story. When the Bruins are in town for a 7 p.m. game, most of the barstools are occupied by 5; by 5:30, it’s standing room only (and even that space can be at a premium). The crowd thins out when the game starts, but the atmosphere stays pretty lively. And if you’re not going to the game, Sully’s isn’t a bad place to watch it. Their six TVs might not be up to the standard established by modern sports bars, but Sully’s possesses a sense of Boston sports credibility that can’t be simply manufactured. Any bar can install a couple dozen TVs, plaster its walls with sports memorabilia, and try to appear like it’s been part of the Boston landscape forever, but long-time fans are too savvy. That said, there are plenty of places near the Garden to have a drink, and I think most of them are pretty cool. But for true diehards, there’s really only one choice. Straightforward. Humble. Quirky. Lovably archaic. More functional than fashionable. I might characterize Sullivan’s Tap that way, but I could use the same words to describe the building that stood across from it for nearly 70 years. 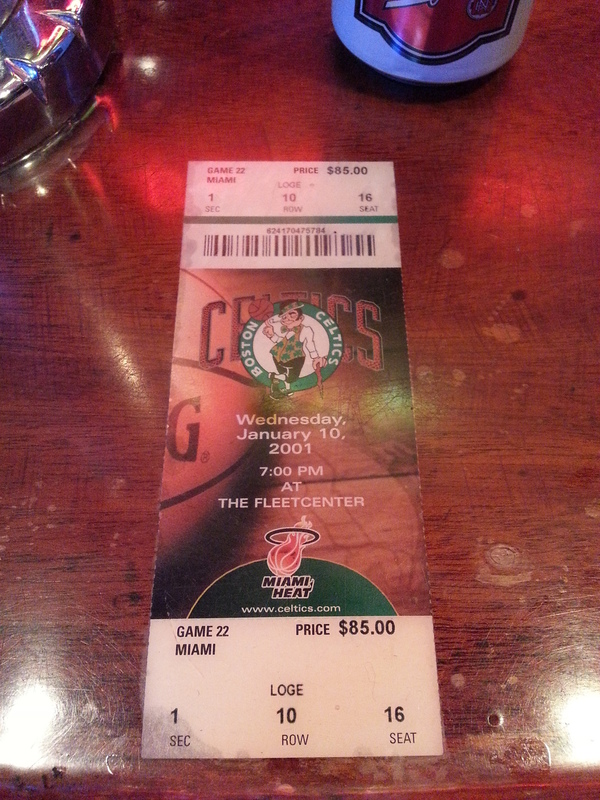 I remember the old Boston Garden. I can’t say that I ever witnessed anything truly historic there, like a breathtaking playoff game or a trophy being lifted. And while the countless images of triumph and anguish that occurred within its walls are ingrained in the shared psyche of multiple generations of Bruins and Celtics fans, my memories of the Boston Garden are a little more personal. I remember a certain simplicity – in particular, an absence of the bells and whistles that punctuate the modern sports experience. I recall with fondness a time when a routine stoppage in play didn’t cue an assault on the senses – music, videos on the Jumbotron, Ice Girls, Celtics Dancers, games, contests, animated bears trying to get the crowd to make some noise. I mean, there’s nothing wrong with that stuff – but the game is good enough without it. Using that time-out to talk with your friend about how the team looks, or dissect the last play – or maybe, when you were young, listen while your dad explained the rules to you – those things have more value to me. And this, I think, is Sully’s’ true appeal – it hearkens back to a time when our favorite games seemed simpler, purer. With the space once occupied by the old Garden poised to become a high-rise development, Sully’s is one of the few remaining connections to the glory days that fuel our present-day passion. 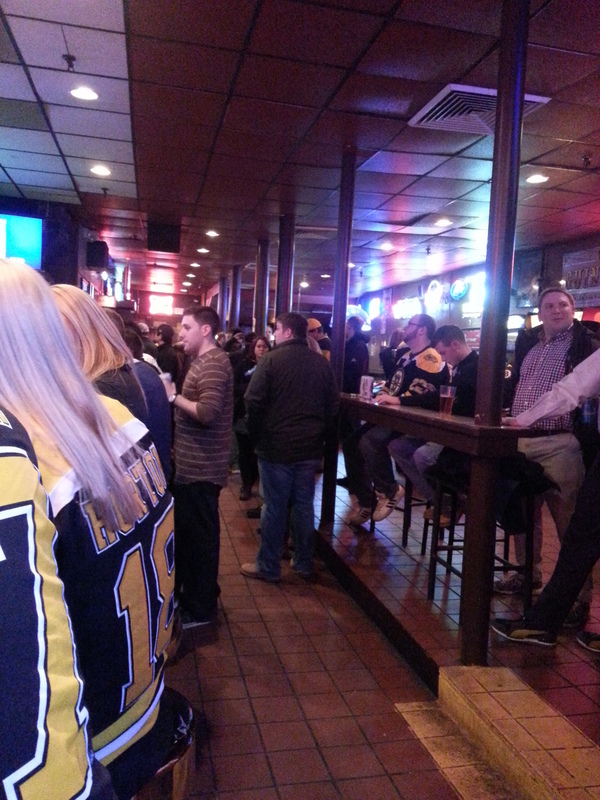 Since 1933, crowds have poured out of the Garden and into Sullivan’s Tap to celebrate a win or numb the pain of a loss. That tradition continues this season. And who knows? Maybe this June there’ll be a thrilling Game 7 that goes into sudden death overtime, and with seconds to spare, an athlete will become a legend, smacking the puck past the goaltender and sending the TD Garden into delirium. If you’ve got a couple hundred bucks to spare, maybe you can score a ticket and watch it with your own eyes. But if you’re OK with a $3 ‘gansett and don’t mind standing, you can still be part of history from across the street.